Dublin Bay Breezes Up for KBC Laser Radial World Championships. 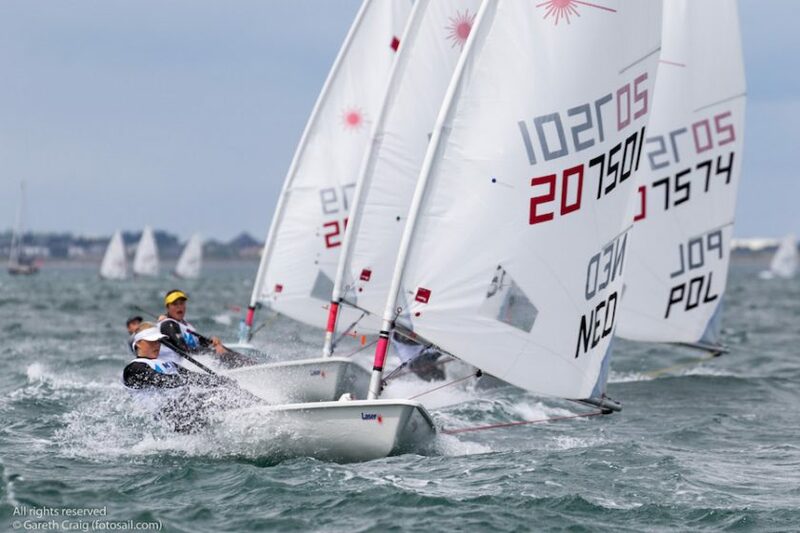 350 Laser Radials from 48 nations got wind in their sails at the KBC World Championships off Dun Laoghaire yesterday as the massive regatta passed its half way stage. After three days of light winds it was all change today when fresh westerlies blew up ideal championship conditions of 15–20 knots and over on Dublin Bay. Only 41 points separate the top ten sailors overall as the massive 229–boat boys fleet is split into gold, silver, bronze and emerald divisions for the final two days of the regatta. Although protests were being heard last night and results are provisional, American Henry Marshall, ninth overall at the 2015 World Championships, leads the boys after eight races by a margin of eight nett points. Keeping Irish podium hopes on Saturday very much alive are two top ten performances from Howth’s Ewan McMahon in second overall on 28 points and the host club’s own Conor O’Beirne in seventh. Third overall is Britain’s Daniel Whiteley who is ten points adrift of McMahon. There is no doubt the regatta has so far served up conditions throughout the wind range as strong wind sailors finally got into their stride today but others had unexpectedly good results too. Italian Paolo Giargia, who was fourth in last year’s competition in Canada, said ‘I’m not normally good in strong winds but today was my best day in Ireland so far, I scored a 10, 5 and 5 so I will make the gold fleet’.